The holiday season inspires reflection upon the past year and excitement about the opportunities knocking on the door of the upcoming New Year. It has been tremendously rewarding for me to see that the obstacles and challenges faced in 2016 not only made us a stronger community, but also deepened our relationships with the city of Phoenix, the College of Medicine – Tucson and our clinical partners in the Phoenix area. Our campus has continued to grow as we now prepare to open the doors of the Biomedical Sciences Partnership Building, and to celebrate the recruitment of several outstanding leaders committed to advancing our aspirations in the areas of education, scholarship and clinical and community service. Of particular note, regarding our recent achievements, is the expansion of our precision medicine efforts and the outstanding collaborations we have established with the Banner – University Medical Center Phoenix. Our commitment to community engagement remains strong, and on January 28, we look forward to hosting thousands of families as part of Connect2STEM, the official kickoff to the Arizona SciTech Festival. We will also continue to prepare for the Liaison Committee on Medical Education (LCME) visit in February 2017 to complete the College’s ongoing accreditation process. 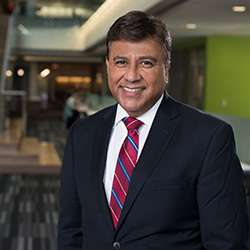 As I reflect on the past year, I am grateful for the honor and privilege to serve as your Interim Dean and to experience first-hand the uniqueness of the College of Medicine – Phoenix. I would like to express my gratitude to our outstanding leadership team for their hard work and dedication, as wll as to the entire LCME team that has worked tirelessly to get us one step closer toward full accreditation for our college. As 2016 comes to a close, let's rejoice in our successes and prepare for an outstanding new year.